ROCKFORD – Two Rock Valley College students, a student in Hononegah High School’s entrepreneurship program, and a recent University of Wisconsin-Whitewater graduate in international business teamed up to win Rockford’s third Startup Weekend. Startup Weekends are organized by TechStars of Colorado and are held throughout the country. They match people with tech ideas with graphic designers and web or app developers who then spend 54 hours over three days turning the idea into a final investor pitch. 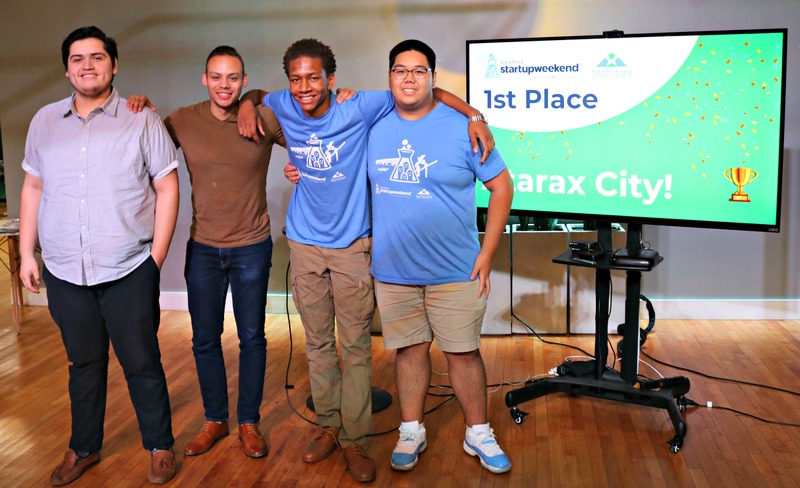 Rockford’s Brandon Xamonhtry, Nasser Orozco and Andre Agosto Jr. and South Beloit’s Jalen Ponder teamed up from Sept. 7-9 to create Ataraxcity. It’s a platform that would curate all the events going on in a city to help new professionals moving to a city to integrate themselves into a community more easily. The idea came from the personal experiences of Orozco, Agosto and Ponder. Orozco moved to the area from Mexico, Agosto from Chicago and Ponder from Detroit. Ataraxcity would mine all of the various event sites, from Meetup.com, and Facebook, to local sites such as RockfordBuzz.com, and the local media calendars to present them in one all-encompassing site. The platform would help companies attract young talent to the Rockford area by showing off the wide variety of events and attractions that are available every week if you only know where to look. The winning team won a variety of business services, ranging from consulting to discounted coworking space, to push the idea forward. Sunday, a panel of three judges, Jimsi Kuborn of the Rockford Area Economic Development Council, Jim Keeling of Hinshaw Law, and Tim Storm, owner of RockTek Workspace in Rockton, chose Ataraxcity over an app that would allow restaurants to gather server reviews, a company that would provide drone services to construction, inspection and real estate companies and a smart cellphone charger. Thinker Ventures, 317 W. Jefferson St., was the host of this year’s Startup Weekend and a sponsor along with the City of Rockford, RockTek, WipFli CPAs and Consultants, NIU-EIGERlab, Hinshaw Law, SolidLine Media of Chicago and KP Counseling. Hononegah and the Rockford School District sponsored students with two coming from Hononegah, seven from Jefferson High School and one from East High School. BeefaRoo, Lino’s of Rockford, Mary’s Market Bakery & Cafe and Lucha Cantina sponsored meals over the weekend. For more information about Startup Weekend, contact Alex Gary at alex@thinkerventures.com or Jaclyn Kolodziej at jaclyn@thinkerventures.com.